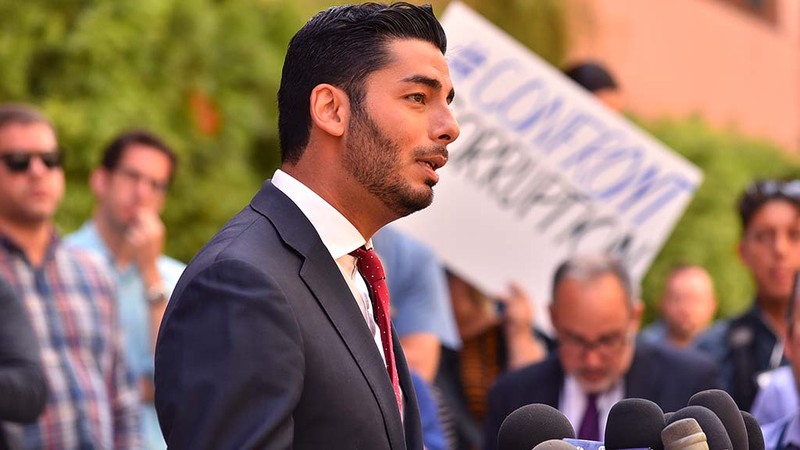 A poll sponsored by the Ammar Campa-Najjar campaign shows the Democratic challenger running neck with Rep. Duncan Hunter in the 50th Congressional District in East County. The poll of 400 likely voters by San Francisco-based Tulchin Research was conducted Aug. 27-30, immediately after Hunter’s indictment by a federal grand jury for alleged personal use of campaign funds. The results, released Tuesday morning, showed both candidates with 46 percent, although the margin of error was 4.9 percent. “That the race is now tied in this historically Republican district suggests that Hunter is paying a significant political price for his alleged corruption, even as he denies personal culpability,” the research firm said in explaining the results. President Trump tweeted Sunday that an expected “easy win” by Hunter is now in doubt and blamed Atty. Gen. Jeff Sessions for letting Hunter be indicted. Hunter has represented the district in Congress since 2009, following in the footsteps of his father, Duncan Lee Hunter, who had represented the district since 1981.